5401 North is located at the intersection of I-540 and Highway 401 in northeast Raleigh, one of the fastest-growing sectors in the metro area. Raleigh is on the move and so are our residents. 5401 North is minutes away from everything you need and everything you love. Whether it’s cheering for your favorite college or professional sports team, attending one of the areas many festivals or concerts, or visiting a museum. A network of major highways surround the community which gives you a fast track to highly desired work centers, medical facilities, schools, shopping and dining venues. Don’t forget that access to dining and shopping will be just a short walk or bike ride away with the future town center in 5401 North. Contact us to see how you can start your life now at 5401 North! 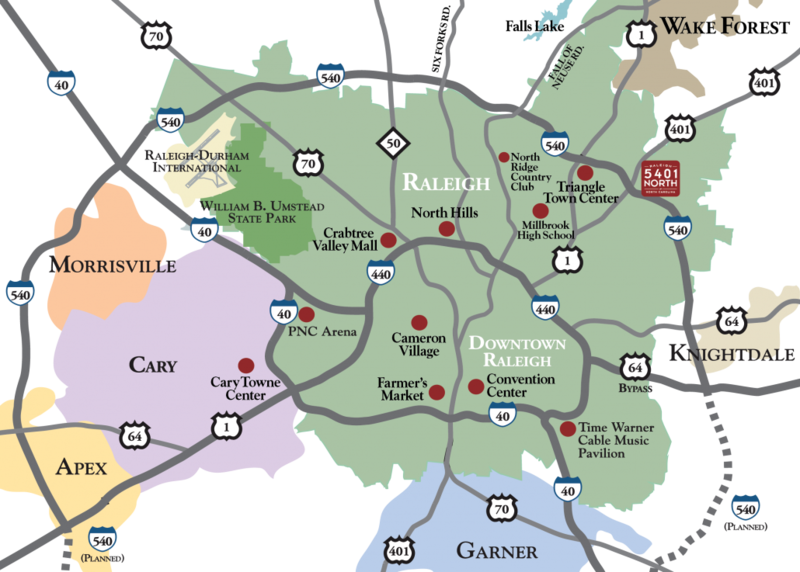 8 miles from downtown Raleigh, 3 miles from major shopping, 20 miles to RDU and Research Triangle Park. Oh…did we mention we are centrally located to the beaches AND mountains. 2 hours to the beach and 3 hours to Blowing Rock/Boone area. Whether you’re a first time homebuyer, have outgrown your current space or want to downsize from your present home, here at 5401 North we truly have something for everyone!